The mission of the City of Eagle Police is to focus on what matters most — creating safer places for you to live, work and play. In 1996, the city began contracting with the Ada County Sheriff’s Office for enhanced law enforcement services. The City of Eagle Police is staffed with a police chief, two sergeants, eight patrol officers, two detectives, a code enforcement officer and one administrative staff. Eagle Police officers can call on fellow Ada County Sheriff’s deputies working outside of Eagle for assistance when necessary. The partnership between the City of Eagle and the ACSO means the City has access to all of the County’s law enforcement resources without the administrative costs of running a fully-independent police department. Chief Patrick Calley is a Lieutenant with the Ada County Sheriff’s Office who has served with the agency since 1989. Prior to being named the Chief of Police in Eagle in Sept. 2014, Patrick worked as a patrol sergeant in the city. Patrick took over for former Chief Steve Bartlett, who is now the Ada County Sheriff. The Eagle Police Department is committed to providing the highest quality of police services with crime prevention and problem-solving being of highest priority. 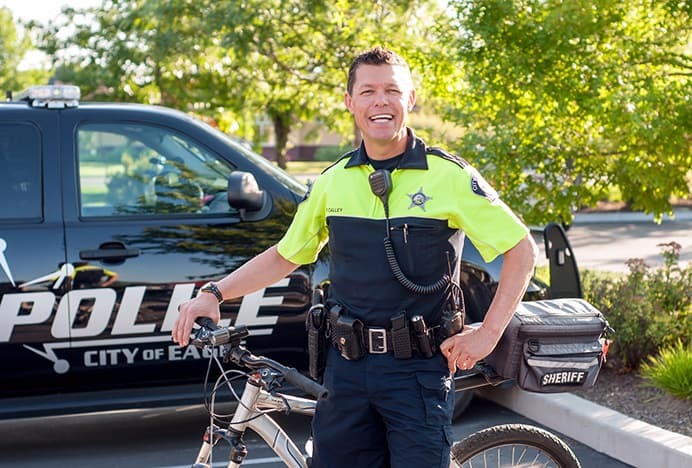 Chief Calley is committed to maintaining the quality of life that the City of Eagle is known for and deserves. Located: 13 miles west of Boise, along Highway 44.